It's a pity that the celebrated writer Jonathan Swift didn't live to witness how cartoons published in one part of the world can disrupt immaculately scheduled travel plans of Heads of States. The latest casualty is the Danish Prime Minister Anders Fogh Rasmussen's visit to India. 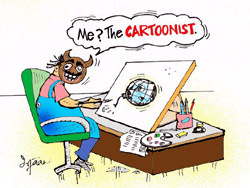 The five day, April 2-7, visit has become the most recent victim of the cartoon controversy. An Indian External Affairs Ministry statement says that, "the two sides have found that the proposed timing for the visit was not optimal," and it has been postponed until further notice. Is this the same External Affairs Ministry that still hasn't finished gloating over the successful visit of the American President George Bush. India has arrived on the global scene with a (nuclear) bang, they all bragged! And the same foreign office officials who were rejoicing and thumping each others backs, are today rescheduling the Danish visit because they believe it will spark fresh protests from the Muslim community. Why is India the 'South Asian emerging superpower' worried about hosting a Head of State. Mr. Rasmussen's visit was supposed to further highlight India's recent economic and political successes. I fail to understand why the Government machinery cannot continue to focus on India's economic and strategic interests rather than worrying that some individuals of a community will protest! By virtue of being citizens of the world's biggest democracy, every Indian has the unrestricted right to disapprove and object. If and when Mr. Rasmussen visits India, some of us will exercise this right by protesting. It is indeed a shame that the Government of India should aspire to make the nation a global power and yet it regulates, controls and revises foreign visits according to the protest climate in the country. Instead of restraining protestors, the government officials should instead focus their attention and resources in ensuring that the protests are peaceful and non-violent. Further any visit and associated protests should not disrupt the everyday life of other citizens. Are we the same nation that invited King Abdullah of Saudi Arabia, the first Saudi king to visit India in 51 years, to be the guest of honor at Republic Day celebrations this January. And our guest made two offers to the country he considers to be his "second homeland" - one, he offered to pay for the repair of the 17th century built Jama Masjid in Delhi and two, he wants to fund madarsas to promote Islamic education in India. I don't remember too many citizens objecting to King Abdullah's very generous offers. If we can host King Abdullah, who desires to dole out favors for a very specific segment of the population of his second homeland, why can't we host Mr. Rasmussen? Has the Indian Foreign office become overtly sensitive to the sentiments and reactions of one particular community! If India postpones this visit, it too joins many other nations in their blind opposition of Denmark. Lets remind ourselves that the cartoons in question have appeared in a Danish newspaper in September last year. The Danish Prime Minister had nothing to do with their publication or distribution. The question is not whether those cartoons should have been published at all. Or whether someone right to express himself should come at the cost of tolerance for other societies. The issue is what message does India with its impressive 8% GDP growth, enviable cyber cities, flush-with-cash-like-never-before middle-class send out to the world? I protest that India has become a nation scared of protests and protestors. What happened to free speech!